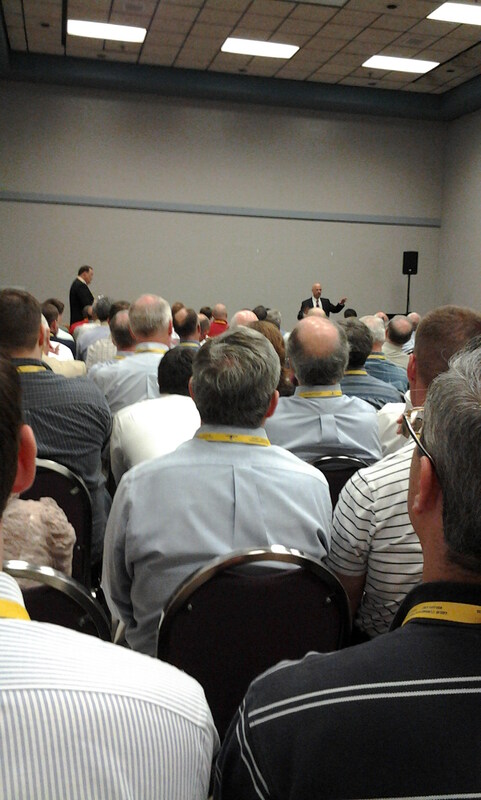 The PCA (Presbyterian Church of America) General Assembly includes a number of seminars on a wide variety of topics each year. This year one talk received considerable attention prior to the meeting because of the subject matter and the presenter. I made the 6 hour drive to Louisville, KY to hear the talk as well as attend other portions of the GA. It is not my intention to review the seminar but only to provide some personal comments and observations regarding the seminar and events surrounding it. Prior to Dr. Davidson’s seminar at 9:15 am I attended another seminar that was excellent and deserved to have been heard by a large number of commissioners but only had about 20 in attendance. I expect the 8:00 am start time was partially to blame for which I am all too aware given I am teaching an 8:00 am class this summer myself:-( But clearly the pre-GA publicity (I am reminded of the adage that any publicity is good publicity) for Dr. Davidson’s talk on the Age of the Earth had the effect of making this the must-see event of the second seminar session because there were 210 seats in the room and I don’t think there was an empty one. Add to that 30-40 people who were sitting on the floor or standing in the back and considering that only a handful were visitors like myself, then almost a quarter of all the commissioners of the GA were gathered in this one small room to hear this talk. I have read a number of comments that have already appeared on blogs about the talk and I listened and participated in numerous discussions following the seminar and it is fascinating to see that the questions and discussion were, and continue to be, completely fixated on only one subject: the source of Adams body. I say the source of Adam’s body because Dr. Davidson made it clear that he believes in the historicity of Adam and Eve but in the question and answer period in response to the very last question he responded honestly to a question about Adam that raised the possibility of some form of evolutionary process. I am sure there were those in attendance that did not want to accept the evidence he presented that suggests the young earth model of the earth holds no explanatory power but I have heard no complaints against the actual evidence he presented. The response seems to be, I didn’t like the answer I heard to the question of Adam therefore I am comfortable ignoring the rest of the presentation which addressed the actual question of the seminar – what evidences are Christians confronted with that challenges the view of a young earth that pastors should be aware? I’d like to present scientific evidence to show that there is life on other planets. When I’m done, I’ll tell you about the time I was abducted by aliens, but don’t let that worry you that the facts I’m sharing aren’t objective. Aside from being a rather bad analogy for many reasons, apparently this person actually has written off everything that Dr. Davidson’s said in his seminar because of his answer to that question. Was the information that Dr. Davidson presented in his talk not actually factual and not the conclusions from those facts rationally presented? This person won’t even allow themselves to consider the content of the seminar. A tempting sarcastic reply would be to say that because of what this person says here everyone should discount anything this person utters from the pulpit as not worthy of consideration. Ironically, Dr. Davidson’s expressed reason for bringing the presentation was to inform pastors of the evidence and arguments that their congregants are being confronted with so that they will understand that simply saying there isn’t any evidence is nonsensical. His concern is that pastors have no familiarity with the evidence other than having been told by young earth advocates that the evidence is all on their side. As a result when confronted with the data it should come as no surprise that pastors credibility should come under attack using the same logic that this commenter has used whether it is fair or not. Overall, I have been left with the impression that even most of the ardent 24 hour types have moved on from trying to directly defend a young earth but have rather decided that a better tactic is to scare people with evolution in hopes that the evidence for an old earth will be ignored (in fact, most clearly are ignoring it themselves). The response to this talk was to avoid talking about the physical evidence as much as possible and attack the messenger. Even if the messenger might be imperfect in some ways this would not necessarily negate the evidence he produced that demonstrates the vacuous claims of young earth scientists. Likewise, pastors are fallen vessels through whom God speaks and we would not negate their entire message for the finding of one sin in the person behind the pulpit. Fortunately, although boldly proclaimed in the blogosphere, comments such as those above are actually not likely representative of the response of the many reasonable men who were in the room at the time. It was clear that the audience was not overly antagonistic but rather the number of nodders from my vantage point outweighed the number that were shaking their heads though most were careful not to exhibit any response. Still, I came away much more encouraged than going in probably because I let some of the over-the-top comments on blogs get me down before the talk. My conversations after the seminar reminded me that reasonable dialogue on this topic is still actually possible when done between real people. One other random note: On the way down to Louisville I passed this sign for the Creation Museum (see image). You may have heard that Answers in Genesis is going to have a hundred or so billboards placed across the country. Here is one of them. I almost missed it because it was so far off of the interstate. You will have to look at the image in full size to be able to read any of it. I was there and I couldn’t read the web address off the sign. If I didn’t know what it was I would not have gotten anything from it. All of the pictures I have seen where they show off their new billboard campaign the billboards are huge things looming over the freeway but clearly this is a lower budget affair. 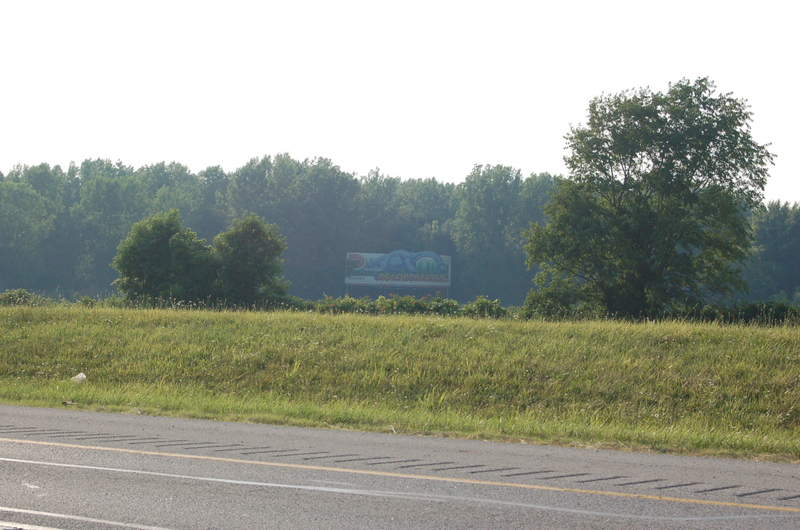 A billboard for the Creation Museum southbound on Interstate 71 at mile marker 41 in Ohio. Picture by Joel Duff. Click for larger image. Thanks for covering this lecture. I couldn’t attend, but I have heard bits and pieces of his presentations. I too believe that Adam and Eve lived as the first couple created by God. However, they would have lived millions of years ago since the evidence now indicates that Lucy and her community were fully human, though not modern humans.